Bend in the River Lodge, Stratford-upon-Avon. A perfect place for a romantic getaway, a relaxing family break or for spending quality time with friends. 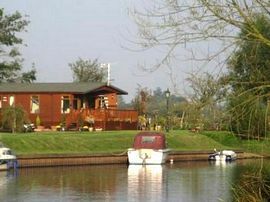 The riverside wooden lodge is privately owned and is located less than a mile from the historic town of Stratford-upon-Avon. The Lodge is tastefully decorated - the perfect "home-from-home" retreat with every comfort for your self-catering holiday. 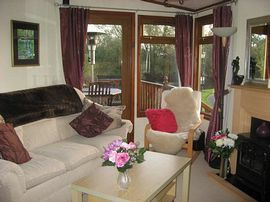 A light, airy and modern Lounge with a door leading to a decked area overlooking the river. There is a 3 seater settee and 2 arm chairs, TV, DVD, Surround sound system, books, CDs, DVDs for your enjoyment. Central heating radiator and a cosy log effect electric fire. The Dining Room has magnificent views to the river and meadow. Bird watchers' paradise with kingfishers, herons, goldfinch, etc. Enjoy your meals whilst watching the cows and their calves walking down the meadow to the river and the kingfisher diving for its lunch. There are 2 comfortable Bedrooms. The Master Bedroom has a Double bed, fully fitted wardrobe, cupboards, hairdryer, en-suite with shower cubicle, toilet and basin. 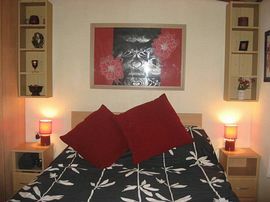 There is a further bedroom with twin beds, fitted wardrobe and cupboards. All beds have comfortable mattresses and luxury linen. The Modern bathroom has a bath and shower with towels provided. The fully appointed open plan kitchen is light and airy, with Gas hob, Electric oven, Microwave, Fridge/freezer and Washing machine, and a wonderful view of the meadow and river. The spacious decking has outdoor furniture for you to enjoy the river views and to take advantageous of the unique riverside location of this Lodge. There is a riverboat taxi that leaves every 30 minutes from the opposite side of the river (you can catch it by crossing the walk bridge)to take you into Stratford. You can also walk into Stratford along the riverside walk. 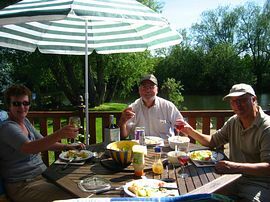 All bookings are made with the owners, Rob and Denny, who will ensure that your stay at Bend in the River Lodge is delightful. They will assist you with any enquiries and there is a comprehensive range of leaflets and maps and an information book in the lodge to help you plan your visits to local attractions. 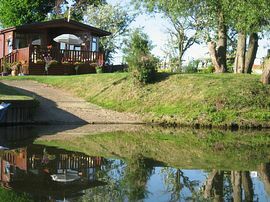 Many people return time and time again to the Lodge once they have sampled the wonderful peaceful riverside location, with all the attractions of Stratford being less than a mile away and close to the Cotswolds. Fishing outside Lodge. Decking for outside dining with fantastic views of River Avon. Golf within walking distance. Riverboat taxi to take you into Stratford town. Boat hire available in town. Local Services: Stratford-upon-Avon has a very rich and varied programme of events and activities throughout the year: theatres, arts, music in the parks, river racing, river cruising, walks along the river. There are a wide and diverse range of shops in town - from designer boutiques to homemade craft and souvenir shops. The Town has an enormous range of bars, cafes, inns and restaurants. The menu choice is eclectic you can choose from the wide variety including British, Mediterranean - French, Italian, Greek, or the Far East - Indian or Chinese and many more - something for every palate. We offer accommodation from 7th March to 7th January.